Inflation is a complicated subject that has been devalued as if it were simply some variable in an equation. It starts with the very premise itself, as if an index of a bucket of consumer prices equals a comprehensive review of the subject. As Irving Fisher realized more than a century ago, money can go into places beyond any CPI’s reach. Not all “inflation” is therefore equal, though orthodox monetary theory has hardened rules for it. Inflation in consumer prices is always good but only so long as it isn’t “too much” where central bankers and economists get to define that limitation without actual economic input. 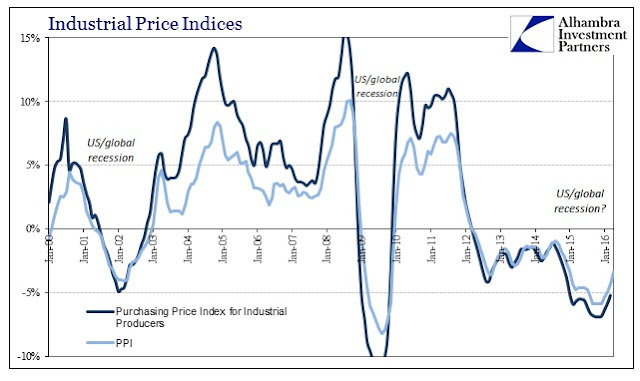 Deflation is always bad and monetary, on the other hand, even though there is a tremendous difference between falling prices due to dramatic overcapacity and prices coming down in the virtuous cycle of innovation and capital efficiency. Thus, capitalism might provide lower “inflation” through technology that central banks then turn into the “need” for more “accommodation” yielding but great distortion. 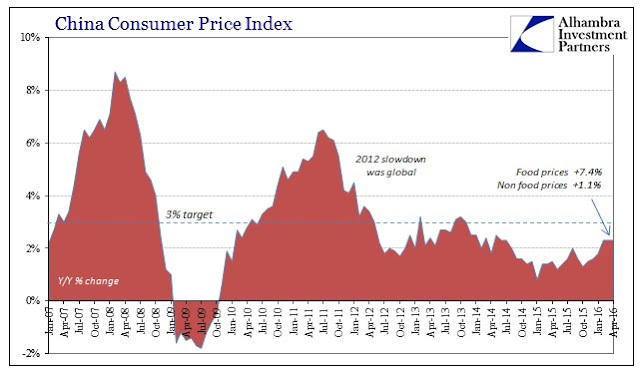 In the real economy on the consumer side, monetary-driven inflation is never a positive while price increases due to supply imbalances (bottlenecks or artificial restrictions) should not be confused into some holistic monetary policy practice. In terms of overarching theory, consumer prices that might be rising as wages rise is not something to be decried and stamped out. Only orthodox economics would seek to limit or extinguish an economy delivering rapidly rising wages. Thus, the whole orthodox philosophical system is set to against large wage gains and the beneficial work of innovation and technology; i.e., prosperity. That is because economic theory makes no distinctions; everything is treated as perfect substitutes. When consumer prices, for example, rise due to rising wages that is altogether a distinct circumstance than when consumer prices rise due to expanding money through credit. The former denotes the healthy monetary circulation of the basic economy through earned income and labor exchange; the latter is taken as the former when it is instead an artificial intrusion that leads to only artificial alterations. Central banks registering no awareness of these differences presume that “their” inflation is a substitute for the healthy economy and thus seek their monetary entrance as if inflation was a singular concept – economic agents are assumed too stupid to notice the difference. There are any number of places around the world where this disparity is being transacted. The most pressing might be in China which has “low enough” inflation that monetary policy can be more “accommodative” in the orthodox view even though prices of basic necessities are in full and seemingly uncontrolled flight. Economists said April’s consumer-inflation rate, well below Beijing’s 2016 target ceiling of 3%, leaves ample room for the People’s Bank of China to continue its easy-money policies in the face of weak demand. China’s economy expanded by 6.7% in the first quarter, its slowest quarterly pace since 2009, bolstered by record credit expansion and ramped-up stimulus spending. In response, Ms. Chen said, she is dining out less and cutting back on pork at home in favor of beans. “I just feel like I don’t have enough money to buy stuff,” she added. Pork prices were up 33.5% in April year-over-year, while fresh vegetable prices jumped nearly 23%. That pushed the overall index of the basket of food prices up 7.4% year-over-year, only slightly less than the 7.6% increase in March. Non-food prices were up just 1.1%. So monetary policy, which can do nothing about pigs and cabbage, seeks to increase prices in the non-food portion through only credit, hoping that turns to wages several steps later though nonspecific on exactly how that would happen, even though food prices remain harmful. China has a dangerous shortage of pigs, not credit. 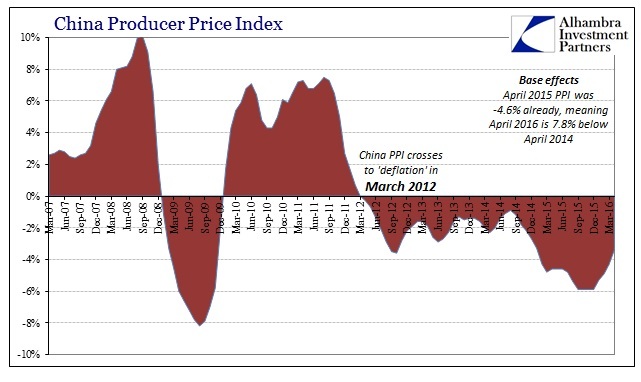 On the production side, producer prices continue to fall though the rate has been decelerating. Some economists have taken that as a positive sign of “stimulus” though it as much base effects and the rebound in commodities without the smashing “dollar” pressure. The PPI fell 3.4% in April, better than -4.3% last month and -5.9% at the worst in late 2015. However, given that enough time has passed in this condition, these numbers don’t do justice to ongoing scale of the decline which is far more important. In other words, the PPI may have been down “only” 3.4% in April but that compares to April 2015 where the PPI was already down 4.6% from April 2014; meaning April 2016 prices (the index of factory gate prices) are down almost 8% across now two years in time. The monetary response is to increase again “aggregate demand” through domestic money and credit in a country drowning in credit and beset by a shortage ofinternational money (and “demand”). Even if there was a realistic channel and pathway for monetary policy, the answer to overcapacity is not to continue that overcapacity by raising “demand” via debt; all that accomplishes, if it ever gets that far, is to further impoverish the economy by both locking in place inefficient capacity while indebting the “demand” side in order to do it. The fact that prices have fallen at the factory gate (as well as in inputs at the front end, as shown by the Purchasing Price Index for Industrial Producers) show very well China’s vise; squeezed by being over-“stimulated” in 2009 and 2012 while at the same time unable to address the external deficiency brought into China’s economy by the global slowdown and eurodollar decay. This is not a situation that “stimulus” can fix, as prior applications of it only made it worse (including just how the pig herd came to be so insufficient). It is unclear whether that was an official statement, but given the outlet it was at least criticism from within government. It makes sense that China would “wake up” first because the repercussions of following orthodox economic theory are much higher in economic, social, and really political terms than anywhere else. There is no realistic scenario for the ruling regime to follow Japan into decades of stagnation and dysfunction. Further, the Chinese are uniquely situated to recognize the current global problem for what it is. Again, they are caught between an internal imbalance that cannot possibly accomplish the great economic task as set out under “aggregate demand.” Overcapacity in industry that is oriented toward exports is not going to be eased or diminished by more internal credit and bubbles. What the Chinese manufacturing sector needs is an actual, healthy global rebound which itself requires an entirely new monetary framework. Orthodox economics gets so much wrong about inflation because it imagines there is nothing interesting about money; as if money is money just so that DSGE models can operate free from singularities. There are so many nuances and differences within the topic that anyone outside economics is not at all surprised that inflation isn’t monolithic, either. Different kinds of price changes and responses to monetary changes, including asset prices, represent potentially vastly different conditions and really implications. 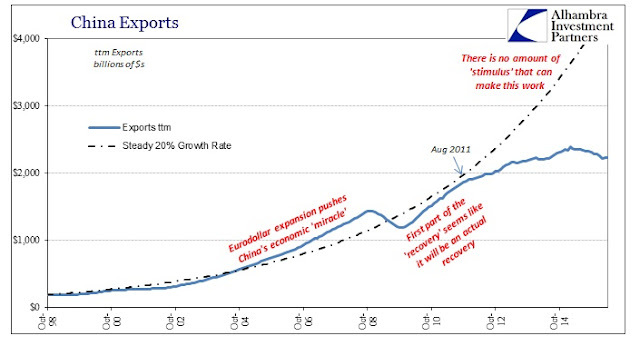 In our current malfunctioning economic existence the first is to stop making it worse; it’s clear that Western economics and its commentary is nowhere near figuring that point, while the Chinese have been at least moving in that direction since late 2013. Central bankers were never capitalists nor free market adherents, but it still should be alarming that the communist managers in China may have a much better grasp of markets and real economics than those in the “free world” that have likewise given themselves the task.